Maximum Print: 9 x 9 x .5 inches (Depends on proportion of artwork/photo supplied. ), Maximum Display Base: 9.5 x 9.75 x 2 inches (Depends on proportion of artwork/photo supplied.). Our clear acrylic display of your own personal artwork or photo! 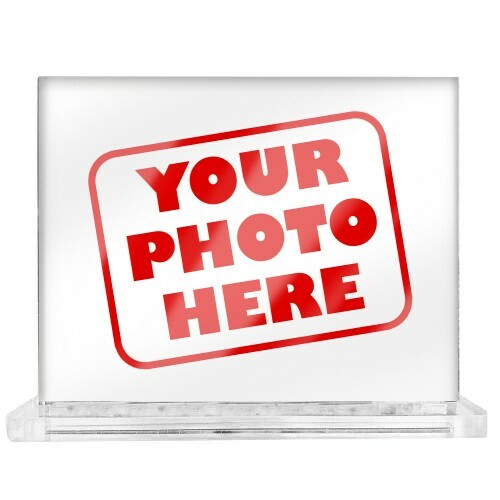 All acrylic displays come in two pieces: a printed or blank base and artwork printed on half inch clear acrylic. Items are printed and produced to order. Printing and processing takes up to 5 business plus shipping time to your location. Item is NOT printed on glass but gives the illusion of glass.Custom Masters Behind The Glass make great keepsakes for many occasions. Use a favorite painting or even a digital photo. HD printed and UV cured for amazing edge two edge prints on half inch acrylic.